1) One theory states that the media and certain government sponsored agencies such as the CDC, NIH and the FDA are hyping the Ebola crisis to promote the roll-out of mandatory vaccines. This notion promotes the belief that Ebola will not impact that many people but the fear being promoted will drive people to help people like Bill Gates make a fortune from the inevitable vaccines. Is this theory correct? Well, yes and no. The ultimate goal of the globalist interests is indeed forced vaccinations. However, the false flag accusers cannot really deny that there are no Ebola cases because there are. 2) The second theory postulates that Ebola will serve as a depopulation instrument AND the elite (e.g. 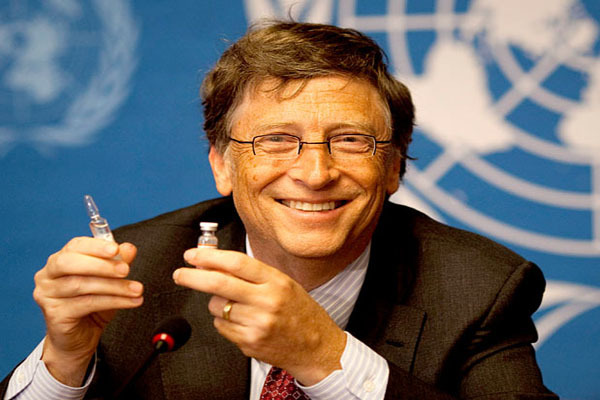 Bill Gates) will make money on the demise of much of humanity through the implementation of mandatory vaccines, while Ebola decimates the population claiming as many as a billion or so lives worldwide and millions within the United States. Both theories are correct and both theories are incorrect. People are dying of Ebola. The ultimate question, along this line of thinking, is whether or not the death curve is going to dramatically spike. Both theories are correct in that the financial goal is mandatory vaccines. However, which of these two positions is correct is totally a meaningless debate and therefore, serves as a distraction from the most important issue which has to do with the vaccines. The answer to where the Ebola crisis is headed is contained within the handling of the differing vaccines. Will the Real Vaccine Please Stand Up? There are lat east two Ebola vaccines. One vaccine has been in development since 2004. The second vaccine, being developed by GSK, is presently in development and will be brought to market by January 2015. To say that this vaccine is being brought to the public a little too fast would be the same as saying that Mt. St. Helens caused the earth to “shake a little bit”. The GSK vaccine will be completed from start to finish in 5 short months. Normal medical protocols dictated that this process should take from 3-5 to years. This vaccine is reckless and will endanger the public’s health upon its roll-out. Not one word of this was reported in the mainstream media and now it is being covered up. The above was a direct copy and paste from Crucell’s Website on September 17, 2014. In the same article that I published the following, I raised the question as to why the American public was not being informed of this development in which the vaccine had been tested on humans as far back as eight years ago. Within two days of publishing the data from Crucell’s website, this is what now appears off of the same link. The requested URL /R_and_D-Clinical_Development-Ebola_Vaccine was not found on this server. My father used to have a saying “The more you stir “excrement” the more it starts to stink”! Those words never rang truer than they do with the weak attempt at a cover up of the existence of this data and then the subsequent cover up by taking down the site for all the obvious reasons. As most Internet savvy people know, it is extremely difficult to cover up a web based story once it has been printed and recirculated thanks investigative tools such as the Wayback Machine. When the web page linking Crucell with the testing of an Ebola vaccine, on two sets of human volunteers, in 2006, was published by yours truly on September 17, 2014, the page was scrubbed after I exposed the existence of their vaccine. Why? Crucell not only developed an Ebola vaccine and tested it eight years ago, they have been caught in perpetrating a cover up of their involvement in the development of an Ebola vaccine. Here is a snapshot of the Crucell scrubbed URL by the “Wayback Machine”. Saved 29 times between October 17, 2006 and October 9, 2014. As readers can see, the date of the publication on the Wayback Machine is September 12, 2014. CRUCELL HAS BEEN CAUGHT IN A COVER UP RELATED TO THE DEVELOPMENT OF ITS EBOLA VACCINE. Now, the $64 million dollar question as to why Crucell is engaged in a cover up. Not only is Crucell guilty of trying cover up the fact that they tested the Ebola vaccine eight years ago, there is yet another cover up. The only research results that are available is what you see here on this site as a copy and paste from the Crucell website. “Crucell’s Ebola vaccine entered Phase I clinical trials in Q3 2006. Two groups of 16 volunteers were enrolled and vaccinated. The study showed safety and immunogenicity at the doses evaluated”. I have looked far and wide for the results of this Phase 1 clinical trials in Q3 2006. They are not in the public domain. I have never seen this before. This speaks to the fact that the results are being covered up. In fact, I would hazard a guess that the results are classified by the Army. Crucell acknowledged the participation of the U.S. Army Medical Research Institute of Infectious Diseases (USAMRIID) in their work on the vaccine. These would be the boys from the infamous Ft. Detrick. Therefore, it is a not a stretch to believe that the clinical trial results are known and hidden. Further, if the Crucell Ebola vaccine was not effective, why go to the trouble of obscuring the results? I can only conclude that this vaccine is successful in mitigating the effects of Ebola, or at least, preventing the transmission. Why Does the CDC Need a “Second” Vaccine? If a vaccine was tested and showed promise in Phase 1 clinical trials, then why would it be necessary to rush a second vaccine to market with such rapidity that it could likely endanger the public? This makes no sense whatsoever, unless, this is a case of a “vaccine for thee but not for me”. The rest of this analysis is speculation. However, it is speculation based upon the known facts and within the context of an already discovered cover up related to an Ebola vaccine. It is difficult to imagine that the first vaccine, presumably successful, would be covered up from the view of the public if it were ever going to be used to combat Ebola. I believe that the first vaccine is only going to be used by the elite for their own safety reasons. The second, more hastily prepared vaccine is more likely the one that will be administered to the general public. This gives rise to several questions that the public needs to be discussing with regard to the fact that the government has one vaccine with hidden results and another vaccine that was produced so quickly that nobody in their right mind should consider taking. 1. Is the second GSK vaccine an instrument of depopulation like we saw in the popular TNT TV show, The Last Ship? 2. Why would the clinical trial results of the Crucell vaccine be hidden to all medical researchers? 3. How do we know that the second vaccine will be safe and will there be and independent clinical evaluation of the second vaccine (i.e. peer reviewed examinations)? Or, are we just supposed to take the word of GSK and the CDC? The country is mired in the debate as to how extensive the Ebola outbreak will become and if it is a false flag. This debate is a waste of time because it has already been decided. Yes, there is Ebola and some people have contracted Ebola. We just cannot be certain how far Ebola will be allowed to spread either by happenstance or by design. And yes, the goal of this crisis is clearly to vaccinate everyone and realize tremendous profits as evidenced by Bill Gates infusion of over $600 billion dollars into this process, donated to the Global Fund, which will be disseminating the vaccines of TB, HIV and Ebola. And if one looks at the recovered website of Crucell, these are the vaccines that they claimed to have been working on when their website was taken down after their work on an Ebola vaccine was exposed. The real debate is not whether Ebola is a false flag even in this atmosphere of never letting a good crisis go to waste, but rather, why are there two vaccines and why is the existence of the first vaccine with its clinical trials being hidden? Let me say it for you. It is hard not to imagine that one vaccine works and the other vaccine may mimic the problems of the H1N1 vaccine. This is the direction that the Ebola debate should be taken.